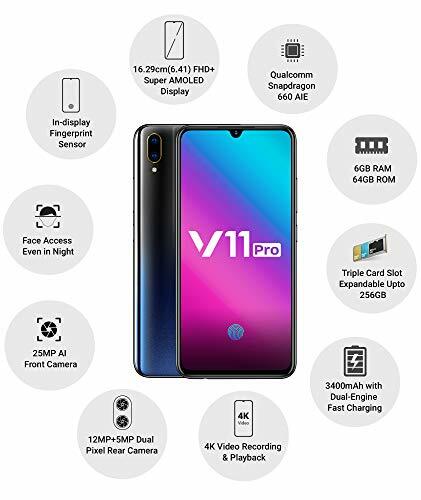 Vivo V11 Pro has 12MP dual pixel+5MP primary dual camera ultra HD mode, ppt mode, professional mode, slow-mo, time-lapse photography, camera filter, live photo, bokeh mode, HDR mode, AI face beauty, panorama, palm capture, gender detection, retina flash, AR stickers, AI face shaping, time watermark, AI selfie lighting, AI scene recognition, google lens, AI portrait framing and 25MP front-facing camera. It has 16.29 centimeters (6.41-inch) super AMOLED FHD+ capacitive touchscreen with 2340 x 1080 pixels resolution with 403 PPI pixel density. 3400mAH lithium-ion battery with Dual-Engine fast charging.